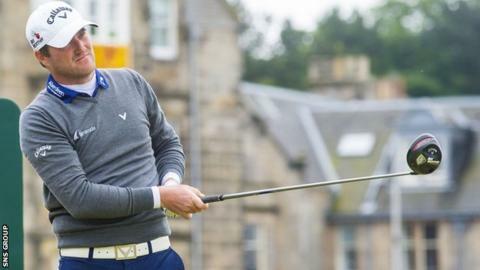 The Scottish challenge at The Open stalled as Paul Lawrie and Marc Warren lost ground during a third round of incredible low scoring. Lawrie, the 1999 champion, began the day in a share of third place but dropped down to a tie for 26th after a two-over par round of 74. Warren, who partnered Lawrie in the penultimate group, is one shot better off on seven under par after a 72. The lead at St Andrews is shared by a group of three on 12 under par. Irish amateur Paul Dunne is a surprise name at the top of the leaderboard, along with 2010 winner Louis Oosthuizen of South Africa and Australian Jason Day. Jordan Spieth, winner of the Masters and US Open this year, is one stroke further back, while Padraig Harrington, a two-time Open winner, is on 10 under par after a 65. Sergio Garcia, Justin Rose and Adam Scott are among a group of nine players on nine under par in Fife. Richie Ramsay, the only other Scot remaining in the field, birdied three of the last six holes for a 70, taking him to three under par going into Monday's final round.